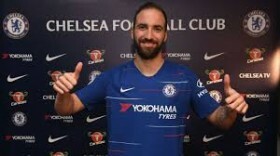 Chelsea have announced their second signing of the winter transfer window with Gonzalo Higuain joining them on a temporary deal from Juventus. The Argentine had spent the first half of the season on loan with AC Milan where he contributed eight goals in 22 appearances for the Serie A side. He has now been reunited with Blues boss Maurizio Sarri after previously working together at Napoli for a single season between 2015 and 2016. "When the opportunity to join Chelsea presented itself I had to take it," he told the club's website. "It's a team I've always liked that has a lot of history, a wonderful stadium." Chelsea had initially sought to secure the deal during the early hours of Wednesday but the delay has meant that the striker has not been registered in time for the League Cup semi-final second leg against Tottenham Hotspur. In his absence, Olivier Giroud could be entrusted with the striker's role, given Alvaro Morata appears on his way out with Atletico Madrid close to sealing his services.